• is better equipped to solve problems in a collaborative way. • is more able to learn and benefit from the varied experiences and talents of its members. • manages conflict more creatively. • is less judgmental and thus able to embrace a wider range of ideas and perspectives. • is enriched by a great variety of different knowledge, stories, and ways of seeing the world. Affirmation is not just for those on the “outside”—it helps all members to bring their whole and authentic selves to the community. As an Affirming Ministry, we can work in many different ways toward the healing and wholeness of creation — challenging bias and discrimination based on appearance, culture, gender identity or sexual orientation, class, or age; working to end racism; promoting economic justice; increasing accessibility; or caring for the planet. So What’s Our First Step at the First United Church? In response to the initial feedback we received from the congregation, the Affirming Ministry Committee is focusing first on affirming differing abilities. • Approached the Building and Property Committee with congregation concerns and suggestions re: accessibility, resulting in the formation of an Accessibility Working Group to focus on increasing accessibility within our church. • Hosted a Circle Conversation centered on Ability and Inclusion on Sept. 24, 2017. —The ideas generated can be found on colorful sticky notes posted on the bulletin board at the rear of the Sanctuary. —The church offering space for their fitness program sessions. The Power Flower is a tool developed in Canada over 25 years ago to assist in educating people about their social identity. It is an attempt to identify who we are in relation to those who wield power in our society. 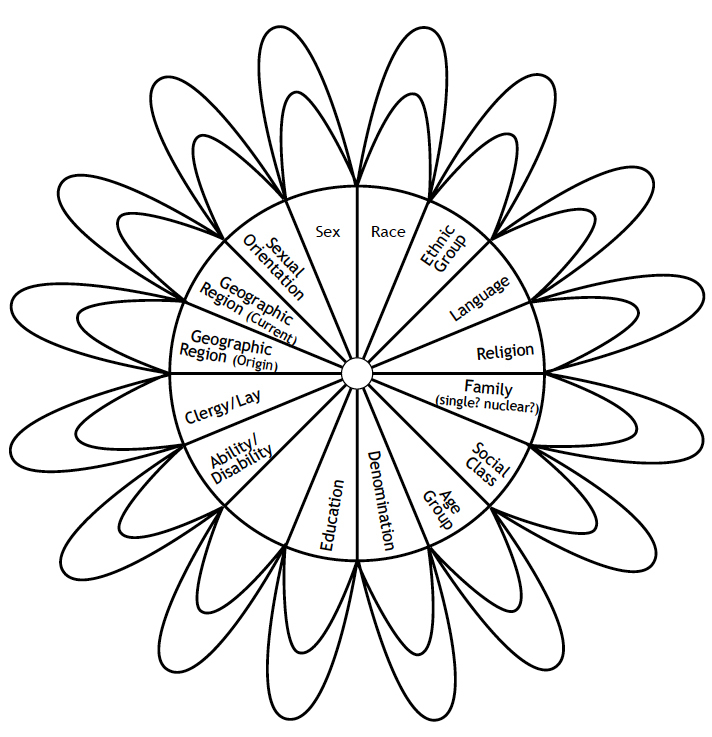 As you can see in the diagram, the centre of the flower is divided into 16 segments, each representing one aspect of our social identity. One segment has been left blank. That has been done deliberately to allow us to identify a category that would be specific to our environment. This centre is surrounded by double set of petals, out outer and one inner. To fill in the Power Flower we start with the outer petals. In each of these outer petals we write the dominant or powerful identities in our society (eg. Ability/Disability – able-bodied or Sexual Orientation – heterosexuall). Then in the inner petals we fill in our own identity. When the flower is complete it is interesting to note how many of our inner petals are different than the outer petals. If they are different this means that we do not share in those areas of power that exist in our society. These are areas where we are on the margins. Note that the majority of these categories are not ones that can be easily changed. Some are aspects of our identity that were determined before we were even born. These aspects of our social identity influence the power and the position that we hold in our society. They may impact how we are perceived or how we are treated by our fellow human beings. Many of us have experienced an incredible amount of privilege in our lives based solely on the colour of our skin, and the country in which we were born. Others have experienced the pain and isolation that comes from being part of a marginalized group, a powerless minority. And most of us have social identities that are combinations of both. Exploring Privilege – What is it & why does it matter? At a church circle conversation we began by watching this short video on privilege, and participated in exploring what privilege means and why it’s important to be aware of privilege. 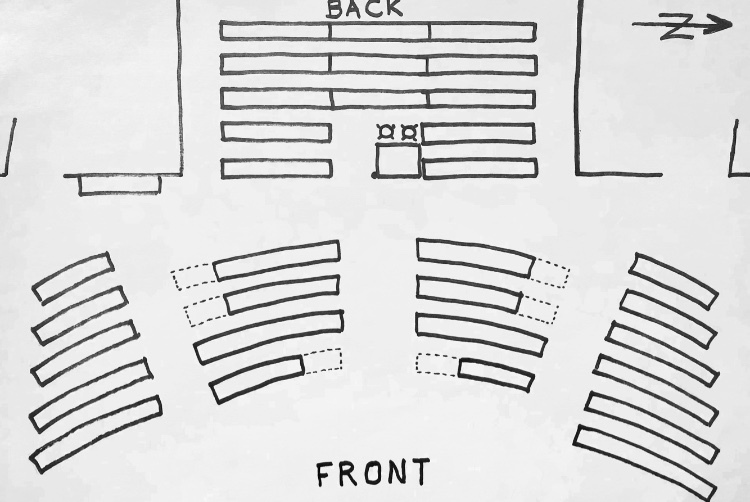 The Affirming Ministry Committee, in consultation with others, has developed a plan to make the First United Church sanctuary more accessible for people in wheelchairs and people with walkers, crutches, casts, and baby car seats/strollers, as well as other accessibility scenarios.The plan is to shorten six pews as indicated in the drawing below. • Four accessible spaces were designated based on guidelines recommending that congregations of 50-300 members create at least that many spaces. • The locations were chosen both because they allow effective access and because they appear aesthetically balanced in the sanctuary space. • Two pews are being shortened in each of the rear locations in order to provide sufficient depth so that wheelchairs do not protrude into the main aisles, thus leaving the aisles clear for wedding and funeral processions. • Pews are being shortened in a variety of locations (rather than removing one entire pew) so that the families/friends of people using the accessibility spaces can sit beside them on the shortened pews. The Affirming Ministry Committee welcomes your feedback on whether we have overlooked anything in our choice of locations for the accessible spaces. Feedback can be left at the Church Office or with our committee members. The deadline for feedback is Feb. 21, 2019. Currently, our committee members are Amy Popick, Janet Keene, Annette Taylor, Amanda Polsfut, Stacie Noble Wiebe and Margaret Lottridge. Please feel free to approach any one of us with your questions and ideas. Or if you feel more comfortable, you can email us at affirm.firstunited@sasktel.net. We welcome your input! We need your input! Your voice matters!